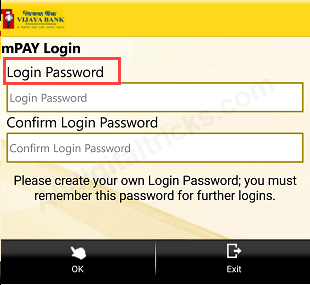 Vijaya Bank customers can access & manage their bank account on smartphone through mobile banking application. Vijaya Bank mobile banking (V mobile) available on Android and iOS both platform. 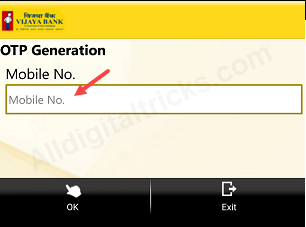 In this post we will tell you step by step guide how to register and activate Vijaya bank mobile banking. Vijaya bank mobile banking enables you check account balance and statement, transfer money to any bank account, request new cheque book and much more. You can activate Vijaya Bank mobile banking at Vijaya ATM or if you just opened your account then bank will automatically enable this facility for your account. Once mobile banking activated, you can install V mobile banking application and complete one time registration process. ATM prompts the Customer to enter his/her Mobile number. Customer re-enters the Mobile number and Confirms. On validation, the ATM displays the message “Your Mobile Number Registered successfully” and prints the same. After successful registration, Customer receives SMS (Service SMS) to his/her Mobile from Bank containing 4-digit MPIN. 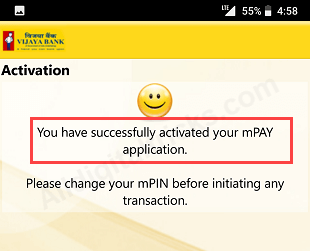 If Bank automatically activate your mobile banking after account opening, you will receive MPIN on your mobile number. 1: Open Application and enter your registered Mobile number and proceed. 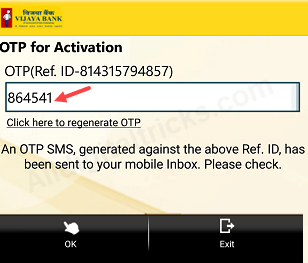 2: You will receive One Time password (OTP) on your registered mobile number, enter OTP and submit. 3: Now set your login password, Set 4-digit login password. 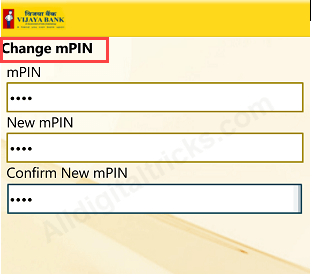 4: Your mobile banking now activated and next you need to change MPIN. 5: Login with login password and change your MPIN. Enter old MPIN which received on your mobile number and set your new MPIN. That’s it your Vijaya Bank mobile banking activated successfully and ready to use. So by following this process Vijaya Bank customers can register and activate mobile banking facility and manage account on phone. Please visit your Vijaya Bank home branch and register your mobile number.